United Progressive Alliance (UPA) chairperson Sonia Gandhi has time and again been a victim of attacks by her opponents, be it on her personal life or professional life. These attacks are based on nothing but only doctored images and twisted facts. One claim that keeps resurfacing every now and then, especially around elections, is that she is one of the richest politicians in the world. The post was shared more than 5,500 times at the time of writing this article. Not just such pages, but the claim has also been carried out by various media outlets such as Aaj Tak, One India, Dainik Bhaskar and Swarajya News. WHERE DID IT START FROM? The claim was first made by Business Insider in 2012 in a report which stated that net worth of the former Congress President was between $2-19 billion. All the media outlets mentioned above had cited the same report as their source. Similarly, Huffington Post, in 2013, published a list titled ‘The Richest World Leaders Are Even Richer Than You Thought’ and Sonia Gandhi’s name was included in the same. Going back to the Business Insider story, it had quoted ‘World’s Luxury Guide‘ website as its source. Alt News tried to access the URL of the website and found that the site did not exist anymore and that it had been taken down since over a year. Even the ‘World’s Luxury Guide‘ had quoted opensecret.org, forbes.com, bloomberg.com, wikipedia.org and guardian.co.uk as its sources in the article on world’s richest politicians. However, it turns out that none of these portals had ever mentioned Gandhi’s name in their articles related to world’s richest leaders. Clearly, neither was the Business Insider a credible source nor was the ‘World’s Luxury Guide‘. 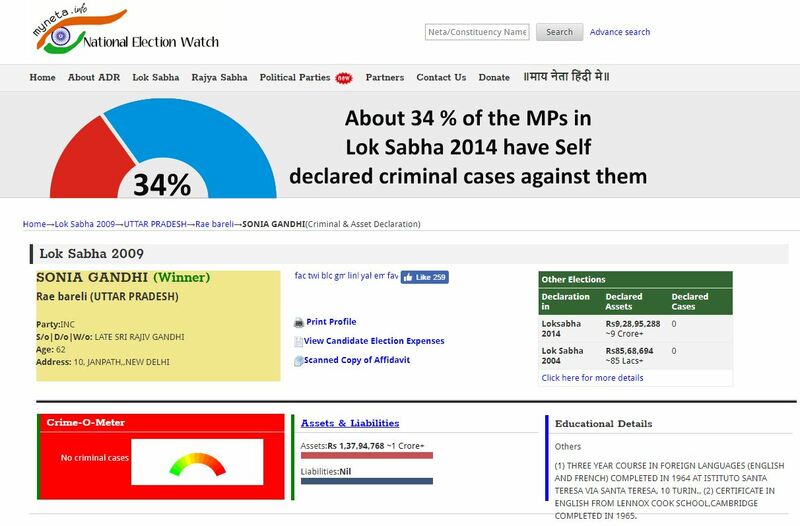 Moreover, the National Election Watch has put Sonia Gandhi’s assets at Rs. 9 crore, which were Rs. 1.38 crore in 2009. Such claims are nothing but an orchestrated effort by a few to tarnish the image of a well-known politician.